Five years after the financial crisis, macroeconomic worries continue to weigh heavily on leaders’ minds. This is confirmed by data from the World Economic Forum’s quarterly confidence indexvi as well as the Global Risks Perception Survey, in which respondents rated major systemic financial failure as the economic risk of greatest systemic importance for the next 10 years. The very same survey respondents also identified the failure of climate change adaptation and rising greenhouse gas emissions as among those global risks considered to be the most likely to materialize within a decade. Compared to last year’s survey, the failure to adapt to climate change replaced rising greenhouse gas emissions as the most systemically critical. This change in our data mirrors a wider shift in the conversation on the environment from the question of whether our climate is changing to the questions of “by how much” and “how quickly”. The narrative emerging from the survey is clear: like a super storm, two major systems are on a collision course. 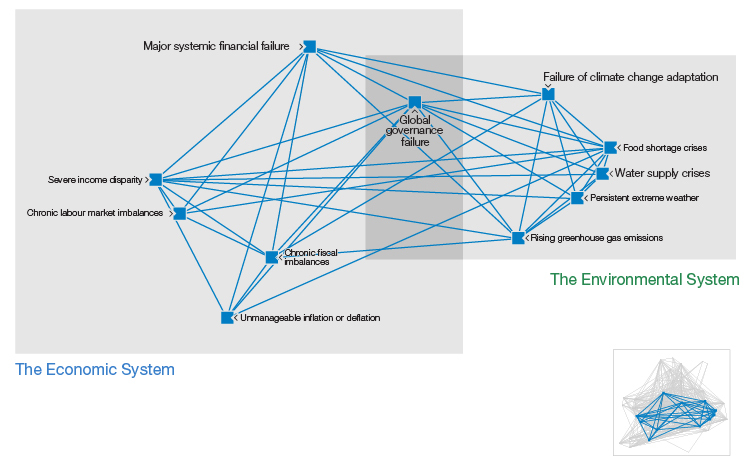 The resulting interplay between stresses on the economic and environmental systems will present unprecedented challenges to global and national resilience. Will countries be able to address complex challenges unfolding on very different time scales simultaneously? A cynic may argue that any future environmental loss could actually have a stimulative economic effect – this is the same rationale used to criticise GDP-driven growth policies, whereby the reconstruction after a massive earthquake can boost overall GDP over the long term. However, this view ignores two realities. First, more people live and work in urban areas than ever before in human history – this concentration will continue and is likely to drive environment-related losses to even greater historic highs. 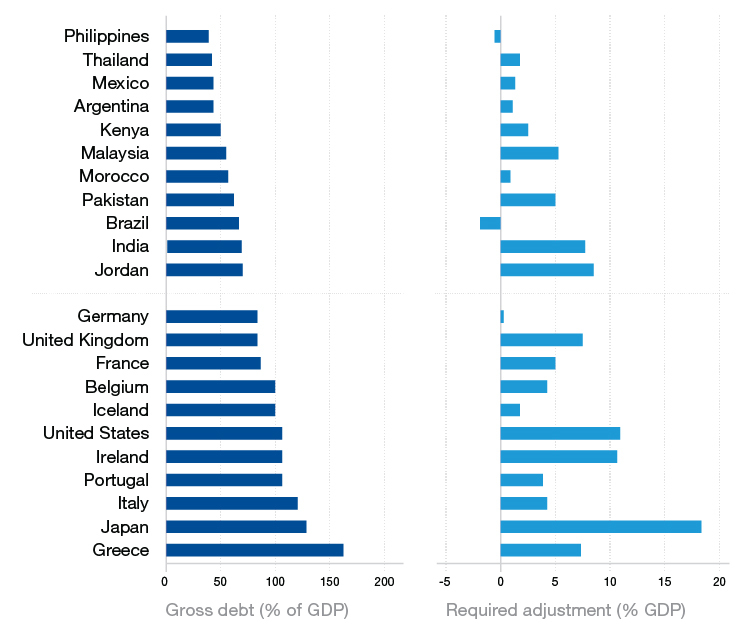 Second, the existing debt levels of many major economies can be unsustainable. Given this fiscal constraint, we are witnessing the use of extraordinary monetary policies to stimulate global growth, which some argue are essentially experimental. The fact remains that today’s huge socio-economic challenges demand immediate attention, yet availability of public resources is limited – especially to finance efforts to avert the long-term effects of climate change, which, in turn, could severely disrupt the global economy. We face a daunting negative feedback loop. The logic of risk management prescribes that countries should invest today to safeguard critical infrastructure and centres of economic activity against future climate-related losses that could be of much greater magnitude. And there is an even more compelling political logic to do this in order to generate new employment and to revive economic growth as soon as possible. But investment in strategic infrastructure is more easily said than done, despite the short- and long-term benefits.1 New approaches are needed that are based on a meeting of minds across varied professions, sectors and geographies; a capacity to act decisively is also needed, despite considerable uncertainty about what the best plan of action might be. Hesitating to act now will only add to the burdens of the next generation. This persistent global economic fragility continues to divert our attention from longer-term solutions by limiting the availability of public resources and generating greater caution in use of scarce funds for strategic investment projects. There are other looming issues related to ongoing prescriptions to counter economic malaise. Will the massive quantitative easing undertaken by key central banks to stave off deflation inevitably lead to destabilizing hyper-inflation? Will structural economic reforms deliver the necessary employment gains over the long run? While there is no consensus on how fast and how much our climate is changing, the growing realization that some degree of climate change is inevitable is reflected in a shifting of the debate to how to adapt. Advocating for greater attention to be paid to adaptation is controversial in some quarters as it is interpreted as a tacit admission that mitigation efforts are no longer worth pursuing. However, the less effective mitigation efforts are, the more pronounced adaptation challenges will become. Therefore, mitigation and adaptation need to be addressed in concert while taking advantage of all possible synergies. A number of climate adaptation related initiatives and reports have been emerging.vii While poorer countries will need help from the international community to finance adaptation investments, adaptation efforts are by their nature local, with countries, companies and individuals being largely responsible for their own adaptation costs. Some people affected by climate change may seek to recover costs from past emitters of greenhouse gases. Although the Alaskan village of Kivalina – which faces being “wiped out” by the changing climate – was unsuccessful in its attempts to file a US$ 400 million lawsuit against oil and coal companies,2021 future plaintiffs may be more successful. Five decades ago, the US tobacco industry would not have suspected that in 1997 it would agree to pay US$ 368 billion in health-related damages.22 For some businesses, investing in climate change mitigation now could be as much about enterprise risk management as about mitigating a global risk. Faced with uncertainty about the likely effectiveness and risk of unintended consequences of a proposed intervention, policy-makers can be paralyzed by a desire to wait for more detailed analyses and data regarding the precise timing, manifestation or impact of future climatic changes in their local environments. Greater support for scientific research, better computational power and data are needed to shed greater clarity into predicting future climatic developments, especially the climate and weather extremes. While this will come, can leaders embrace the need to make a decision without the complete assurance that they are making the best decision? This is more easily said than done, especially when there are competing demands for attention and resources. For example, the 2008 financial crisis shows how urgent macroeconomic difficulties can divert attention from other significant global governance challenges, from climate change negotiations to the Millennium Development Goals. Yet the actions of the G20 during the crisis also demonstrate the potential for bold, coordinated international action. The cumulative effect of such cognitive biases is that we may not pay due attention, or act effectively on, risks that are perceived to be long-term and relatively uncertain. The impossibility of fully eradicating ambiguity, along with the relatively lengthy time scales involved, mean that cognitive biases are likely to remain significant hurdles to be acknowledged and overcome on the path towards effective action on climate change and related risks. Acknowledging the effect of our cognitive biases may be the first step towards building resilience against a future perfect storm of economic and environmental challenges. Only then can we start weighing the various demands equally, in the near and the long term, on scarce public resources and dwindling risk-mitigation budgets. In light of the increased certainty that global temperatures will rise to some extent, a “climate-smart” mindset needs to permeate all levels of decision-making. “Climate-smart” is a term that originated in agriculture, to describe such agriculture that not only increases resilience in light of climate adaptation but also reduces greenhouse gas emissions.35 A climate-smart mindset incorporates climate change analysis into strategic and operational decision-making. It entails a search for synergies across climate change mitigation and adaptation-related efforts where possible. Such a mindset needs to become an integral part of our urban planning, water- and food-security management, investment policy, and demographic policy development, among others. In 2006, during its term over the rotating European Union presidency, Finland introduced a policy innovation which encouraged ministers with other portfolios – from transport and urban planning to agricultural and employment policies – to consider the effects of their decisions on the population’s health.36 Something similar may be needed to ensure that all ministers enact policies in their domains that are informed by a climate-smart mindset. The current debt crisis of several leading economies will make it more difficult to finance climate-smart activities, such as the Smart Grid Investment Grant. That said, the private sector has a critical role here as well. In the United States, about 80% of critical infrastructure is owned or operated by the private sector, not governments.37 It is likely that many of the preparations to weather the colliding economic and environmental storm systems will be found in private-sector initiatives to reinforce critical assets and shield them from potential future risks and liability. Given the pressure on public finances generally and their scarcity to address climate change-related challenges, new funding models will need to be found. Private funds can be unlocked through innovative public-private collaboration that ranges across disciplines as well as stakeholders. In order to enable scalable, effective partnerships, a variety of actors and professional disciplines will need to converge on mutually beneficial and economically sustainable solutions. This is no minor task since, in addition to the diversity of interests at stake, different professionals often have conflicting biases and have been trained to think in siloed ways. Yet such partnerships have started to emerge. In order to address the current shortfall in green infrastructure in a number of emerging economies, more than 50 leading companies from finance, infrastructure, energy and agriculture sectors joined public institutions to form the Green Growth Action Alliance (G2A2). As described in greater detail in the section below, the aim of this initiative is to unlock greater sums of private investment for green infrastructure. As the world faces a squeeze in public funds at the same time as the effects of climate change are increasing, it is only through collaboration among governments (to further the public interest), businesses (to search for innovative products and solutions), legal experts (to mitigate fear of liability), science (to bring good quality supporting data and analyses) and the financial sector (to innovate and avoid future damaging costs) that the limits of environmental and economic resilience can be successfully navigated. How will we reconcile climate change mitigation and adaptation efforts with the desire for prosperity given current demographic trends? How can like-minded municipalities, companies and communities drive forward a new set of climate-smart approaches that avoid cognitive biases? How can we rethink cross-industry collaboration to find the right balance between competition and cooperation among companies in a resource-constrained and increasingly interconnected world? As emerging economies grapple with how to grow their economies without worsening their environments, many are developing “green growth” strategies designed to attract investment in sustainable water, energy, transport and agricultural infrastructure. Up to US$1 trillion a year of private sector investment is needed, according to the 2012 B20 Green Growth Task Force. However, due to the limited track record of some technologies, combined with the perception of investment risk, private capital providers are often reluctant to invest in green growth. Highlight innovative models for public-private collaboration: The G2A2 will launch a report at the 2013 World Economic Forum Annual Meeting identifying existing sources of finance and pinpointing innovative ways for public policy to unlock private funds. Stimulate private investment at country level: The G2A2 is working with the governments of Kenya, Vietnam and Mexico to incubate innovative financing models with the domestic and international private sector. Provide new ideas and models to shape the policy agenda: The G2A2 has formed working groups on green free trade, end-user financing of renewable energy, institutional investors and energy efficiency. The energy efficiency working group is looking to pilot new financing structures for energy services companies; the green free-trade group has led calls to establish free-trade regulations for clean technologies such as solar. Help to scale up and replicate successful approaches: To help governments, development banks and finance institutions to ensure rapid replication and to scale up successful models, the G2A2 will document case studies in the Green Investment Report and engage with policy platforms and investor networks, such as the G20 Development Working Group and Finance Track group on climate finance, the UNFCCC’s Momentum for Change Initiative and the International Development Finance Club. The G2A2 will also collaborate closely with the UN Sustainable Energy for All Initiative and the Global Investor Coalition on Climate Change. The World Economic Forum is serving as the secretariat for the G2A2. Source: Adapted from IMF Fiscal Monitor, 2012 as cited in Global Economic Prospects, Managing Growth in a Volatile World. June, 2012. Washington DC: World Bank. Source: Adapted from Shaping Climate-Resilient Development: A Framework for Decision-Making. 2009. Economics of Climate Adaptation Working Group. Source: Adapted from sigma natural catastrophe data base of Swiss Reinsurance Company. 1 Strategic Infrastructure Steps to Prioritize and Deliver Infrastructure Effectively and Efficiently. September, 2012. Geneva: World Economic Forum in collaboration with PwC. 2 World Economic Outlook: Coping with High Debt and Sluggish Growth. October, 2012. Washington DC: International Monetary Fund. 3 Global Economic Prospects: Managing Growth in a Volatile World. June, 2012. Washington DC: World Bank. 4 World Economic Outlook: Coping with High Debt and Sluggish Growth. October, 2012. Washington DC: International Monetary Fund. 5 Global Economic Prospects: Managing Growth in a Volatile World. June, 2012. Washington DC: World Bank. 6 Eichengreen, B. “Europe’s Populists at the Gate”. Project Syndicate, A World of Ideas, http://www.project-syndicate.org/commentary/the-political-risk-to-the-euro-by-barry-eichengreen, 2012. 7 Tonkin, S. “Global Experts Poll: Economic Confidence Plummets to Lowest Level in Five Quarters”. World Economic Forum, http://www.weforum.org/nr_gci5, 2012. 8 Smart Grid Investment Grant Program, Progress Report. July, 2012. U.S. Department of Energy, Electricity Delivery and Energy Reliability. 9 Too Late for Two Degrees? 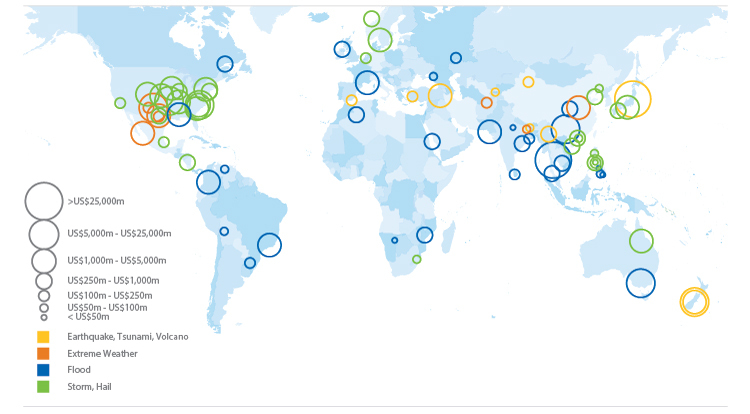 Law Carbon Economy Index 2012. November, 2012. PricewaterhouseCoopers LLP. 10 World Energy Outlook 2011. 2011. Paris: International Energy Agency. 11 Turn Down the Heat. Why 4 C Warmer World Must Be Avoided. A Report for the World Bank by the Potsdam Institute for Climate Impact Research and Climate Analytics. November, 2012. Washington DC: World Bank. 12 Garside, J. “Thailand Flooding Costs Lloyd’s of London $2.2bn”.The Guardian, http://www.guardian.co.uk/business/2012/feb/14/lloyds-thailand-flooding-2bn-dollars, 2012. 14 Tavanti, M. “From Food Insecurity to Food Security: Understanding Human and Food Security Implications for Somalia and the Horn of Africa”. Somalia Strategy Review, http://www.somaliastrategyforum.org/journal/v1i1/tavanti_foodsecurity_v1i1.pdf 2012. 15 “Hurricane Sandy’s Rising Costs.” The New York Times, http://www.nytimes.com/2012/11/28/opinion/hurricane-sandys-rising-costs.html, 2012. 16 Shaping Climate-Resilient Development: A Framework for Decision-Making. 2009. Economics of Climate Adaptation Working Group. vii For examples please see “Shaping Climate-Resilient Development: A Framework for Decision-Making” by the Economics of Climate Adaptation Working Group, “Managing the Risks of Extreme Events and Disasters to Advance Climate Change Adaptation” Special Report of the Intergovernmental Panel on Climate Change, and Private Sector Initiative of the UNFCCC’s Nairobi Work Programme featuring good practices and climate change adaptation activities undertaken by the private sector (some of which have been carried out in partnership with NGOs or the public sector) across different regions and sectors. Private Sector Initiative - Database of Actions on Adaptation”. United Nations Framework Convention on Climate Change, http://unfccc.int/adaptation/nairobi_work_programme/private_sector_initiative/items/6547.php, 2012. 17 Climate Change Scenarios–Implications for Strategic Asset Allocation. 2011. Mercer. 19 The 2°C Target. Background on Impacts, Emission Pathways, Mitigation Options and Costs. July, 2008. EU Climate Change Expert Group. 20 Lean, G. “Micronesia Lawsuit Highlights Climate Change Litigation”. The Telegraph, http://www.telegraph.co.uk/earth/environment/climatechange/8533367/Micronesia-lawsuit-highlights-climate-change-litigation.html, 2011. 21 Saxe, D, James, M. “Kivalina Loses its Climate Change Nuisance Case Again”. http://envirolaw.com/kivalina-loses-climate-change-appeal/ 2012. 23 Based on comments from expert review. 24 Palmer, T. A CERN for Climate Change. In Physics World, 2011, 24: 14-15. 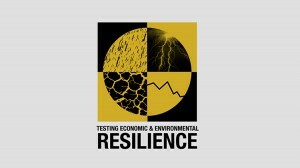 25 Shaping Climate-Resilient Development: A Framework for Decision-Making. 2009. Economics of Climate Adaptation Working Group. viii The phrase “rule of thumb” means a quick and easy way of making estimates, based on experience that will not be precisely accurate but will nonetheless be adequate for most everyday situations. 28 Michel-Kerjan, E., Lemoyne de Forges, S. and Kunreuther, H. Policy Tenure Under the US National Flood Insurance Program (NFIP). In Risk Analysis, 2011, 32(4): 644-658. 29 Kunreuther H., Meyer, R. and Michel-Kerjan, E. Overcoming Decision Biases to Reduce Losses from Natural Catastrophes. In Behavioural Foundations of Policy, E. Shafir (ed). 2012. Princeton: Princeton University Press. 30 Laibson, D. Golden Eggs and Hyperbolic Discounting. In The Quarterly Journal of Economics, 1997, 112(2): 443-478. 31 Based on comments from expert review. 32 Kunreuther H., Meyer, R. and Michel-Kerjan, E. Overcoming Decision Biases to Reduce Losses from Natural Catastrophes. In Behavioural Foundations of Policy, E. Shafir (ed). 2012. Princeton: Princeton University Press. 33 Based on comments from expert review. 34 Nicholls, R.J., Hanson, S. and Herweijer, C. et al. Ranking of the World’s Cities Most Exposed to Coastal Flooding Today and in the Future, Executive Summary. 2007. Organisation for Economic Co-operation and Development. 35 “Climate-Smart” Agriculture: Policies, Practices and Financing for Food Security, Adaptation and Mitigation. 2010. Rome: Food and Agriculture Organization of the United Nations. 36 Puska, P. Health in All Policies. In The European Journal of Public Health, 2007, 17(4):328.